Montel Williams Living Well Pressure Cooker claims it can retains moisture, nutrients and vitamins in foods by reducing the cooking times. It claims it will save your energy and time. Included in the package is over 100 recipes. With your help we can reach more people and let them know about Montel Williams Living Well Pressure Cooker whether this product works or not. I purchased this Pressure Cooker 9 months ago and now can't use it. When I plug it in I get a code of F2 and none of the buttons will work. What a waste of money. Do not purchase the MW Living Well Pressure. My wife and I purchased the unit and it worked great for about 6 months than the handle started leaking steam. Lucky for us we purchased the warranty for it and got a replacement right away. The issue is back and now I can no long get any replacement because Montel discontinued the product. He no long supports it and everyone how purchased the unit along with the warranty are out of luck. I will never purchase anything with his name on it again. He gives you the spill, but don't stand behind the product. Even his website for the product is no longer up. Try it if you don't believe me. Just type in MW Living Well Pressure Cooker. My recommendation is to not buy it! I have been using this pressure cooker for 2 years without any problems until now. For some reason it went through the cooking cycle but now I can't get the lid off. I called customer service which is in some other country and they were supposed to call me back but havn't. Very poor customer support and I am afraid I am going to have to take a loss on this cooker. I have used it two nights in a row now and love it. it cooks as fast as it says and food tastes great. I have cooked chicken, noodles and a corned beef brisket that only took one hour and was very tender. I wish he would come out with larger cookbook. I have used this machine several times and had no problems. I have made ribs,fish and I tried a pasta that did not work out so well, hence the 4 instead of 5 stars. The only concern I have is finding a replacement gasket for it. When I cook the ribs they come very tender and fall off the bone. I have not tried to broiler a glaze on them yet, that is next time. I have been able to cook from frozen just by adding 10 minutes to the cook time. The only other problem is when I add the necessary liquid to the ribs in accumulates wiht the juice from the meat and the ribs are swimming by time they are done. I am so disappointed and upset. Listen everyone, do not buy the Montel Williams pressure cooker. It is a piece of garbage and does not cook the way it says it will. 30 minutes is an hour. Shoots liquid out the top and goes everywear. This was the 2nd time I used it. I should have listened to my grandma. I would have been better off purchasing a real stove top pressure cooker and she would have taught me and I would not be upset and out all this money not to mention the wasted time. I tried to return this unacceptable item. They offered a $24.99 discount then I found out that I could not return it at all. QVC sells it for $99.99. I would have been able to return it to QVC with out a problem. 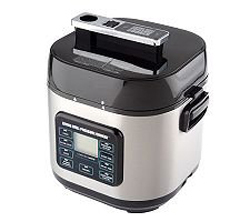 The mypressure cooker.com company said that it is �Company policy� I am upset with the way that company does business. Especially using Montel Williams name and wont stand behind their product. Their call center is not in the United States. No customer service skills. They hung up on me. All I want to do is return a product that I have a receipt for that I am very unhappy with. I would have never bought this product if it did not have Montel Williams name on it. Stupied me never again. Beware all Americans. Be really careful what you are buying on TV. You are more than likely sending money outside the United States and will not be treated fairly when you have a problem and especially when you want to return the item. I am out $179. I guess I have no recourse but a lesson learned not to EVER buy anything over the TV again. I hope Montel sees this. But maybe really don�t care either as long as he is getting his share.